Shortly upon graduation in 2327, Picard's promising career nearly ended abruptly during a layover at Starbase Earhart. During a bar brawl over a rigged game of dom-jot, he was stabbed through the heart by a Nausicaan, and had to undergo emergency surgery to replace his heart. He laughed after looking down to see the knife protruding from his chest. This event helped him realize how fragile life could be, and thus made him more willing to take risks and make his mark in the universe, which he only realized when Q proposed him to change this event in 2369. As an ensign, Picard was posted to the USS Reliant, where he served with Lieutenant Nakamura. As a junior officer, Picard was the closest of friends with Walker Keel, and also became friends with Jack Crusher and his fiancée, Beverly Howard. In 2328, Picard was granted a special shore leave to run an elite, long-distance race on a barren planet in the Elyrion system. Unfortunately, he did not finish in the top five. However, during his time on the planet he befriended a young Zartani named Nuadra Demmix, and also gained experience with the Ubarrak. Picard demonstrated command abilities early in his career, in particular, when he led an away team on Milika III to save an ambassador. This incident would later be mentioned by Q as one of the crucial events forming Picard's personality. As a young lieutenant, Picard attended the wedding of Sarek's son, where he briefly met Sarek and Spock for the first and only time before the 2360s. 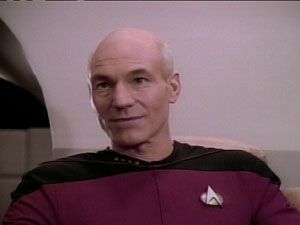 Picard hand-picked most of his senior staff, such as two young officers who impressed him enough upon first meeting. Geordi La Forge once piloted Picard's inspection tour shuttle and stayed up all night to refit an engine part Picard had made a passing comment on, and Picard witnessed Natasha Yar risk her life to save colonists amid a Carnelian minefield. He had also picked William T. Riker as his first officer and promoted him to commander sight unseen, impressed by the young officer's record of independence. Commanding the Enterprise on her first mission, Picard made first contact with a member of the Q Continuum – Q. Picard and his senior officers had to stand trial for Humanity's immaturity. To prove their worthiness as a species, Picard had to solve the "mystery of Farpoint Station." The crew of the Enterprise discovered that the inhabitants of Deneb IV, the Bandi, had captured a space-dwelling being to serve their own purpose. The Enterprise helped to free the creature, and Q, somewhat disappointed by the crew's success, retreated, though he hinted that it would not be their final encounter. During the test of Kozinski's "modifications" to the engines the Enterprise ended up travelling to a different quantum reality and into the year 2379. After the arrest of Admiral Janeway Picard was placed as temporary commander of Project Full Circle until a permanent replacement could be found. Picard was supposed to explore the planet of the Sky Spirits but that assignment was postponed when Captain Janeway and Commander Tuvok on the alternate Voyager were relieved of duty. Picard was given temporary command of the alternate Voyager with Commander Walker from the Quirinal as his First Officer.